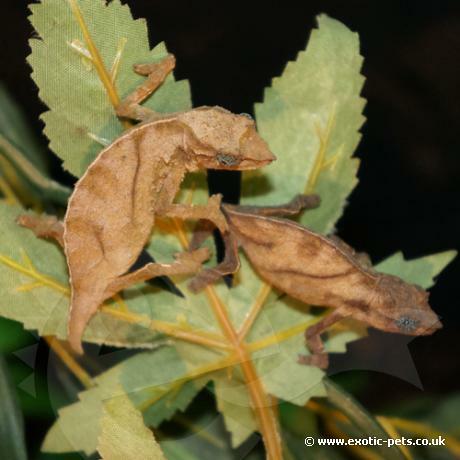 This is a new species to the hobby and is a great little Pygmy Chameleon, they only reach an adult size of 5-7cm. They are a communal species with males and females living together in low vegetation and on the forest floor and among leaf litter. What does a Pitless Pygmy Chameleon look like? Resembling a dead leaf, colouration is usually shades of brown or grey with two to three thin dark stripes along the flank. Small projections are present around the head area and legs. This species can turn the eye sockets a shade of blue, which really makes them a stunning Pygmy Chameleon to own. The tail is short and stumpy, females having the shortest. Adults are small measuring 5-7cm (2-3 inch), the young are approx. 2cm when they hatch. This species of Pygmy Chameleon is relatively new in the hobby and makes a great alternative and hardy pet. Where are Pitless Pygmy Chameleons from? Found in low vegetation and within leaf litter on the forest floor. They can be found in Ukinga Mountains and the Kipengere range in Southern Tanzania. How do you keep Pitless Pygmy Chameleons? This species like other Pygmy Chameleons are very easy to keep and maintain. We keep a small group of five in a 30x30x30cm Exo Terra Terrarium. Use a mixture of peat, fine orchid bark and leaf litter for the flooring. Place twigs throughout the enclosure with real or artificial plants to give this a natural look. They do not require much heat, room temperature of 20-22C is a good range. You can provide a small basking area with a low wattage bulb connected to a thermostat during the day and allow the temperature to drop between 16-18 at night. As for UV lighting, there are different options on this. Some people say they must have UV to help produce calcium, but as this species lives in low vegetation and on the ground, an energy bulb gives off enough UV. We are going to try this out, but already know of a breeder using this method and so far they have not experienced any problems. The energy bulbs are also ideal as they only give off a small amount of heat (perfect for Pygmy Chameleons) and they are much cheaper to run! As for feeding, try to vary their diet as much as possible. They will eat a number of small insects ranging from crickets, locusts, wax worms, fruit flies, house flies and small spiders. Dust the food with a vitamin and calcium supplement, babies on every feed, adult should be dusted once a week. We would recommend Nutrobal or Sand Fire Chameleon Dust. A water dish is not required with this species, they will only drink running water. You should aim to spray twice a day, morning and evening. Do not directly spray the Chameleon, but spray the plants they are resting on. You can also provide a small waterfall which also adds to the natural look.